By Hongkiat Lim in Freebies. Updated on November 20, 2017 . Once in a while, we collaborate with creative designers to giveaway free stuff to readers through hongkiat.com. We figured it benefits all parties – creators get the credit and some exposures, readers get to download them for free with no strings attached. Today, we are going to do the same thing again. 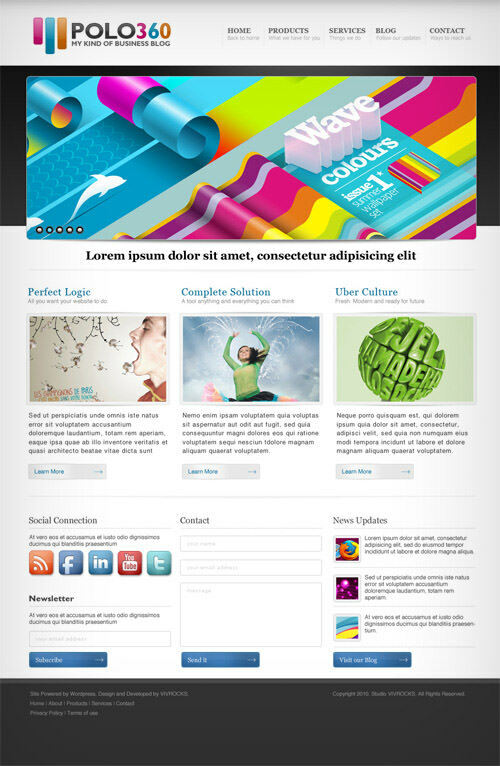 Viv Singh has designed a high quality web template for us. It is available in Photoshop PSD format. All layers are open so you can do any chances you want. Named Polo360, this template is suitable for portfolio site, WordPress home page or corporate site. It’s free to download and use in any personal or commercial projects, but please do not re-distribute or re-sell. Here’s a preview of the template. If you like it, feel free to leave a comment below to thank Viv, or share this page with your friends. Polo360 web template comes in Photoshop PSD format. You can use it for both personal and commercial projects.